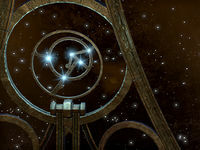 Restore the corrupted memory stars inside the Mnemonic Planisphere. Mnemonic Planisphere — Help secure Sotha Sil's memories. 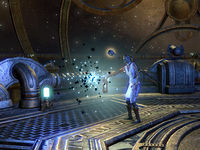 Cultists have attacked the Mnemonic Planisphere in order to steal Sotha Sil's memories, manifested as glowing stars. Amili Lloryn has tasked me to rescue these stars and return them to the Planisphere's sky. Talk to Amili Lloryn outside the Planisphere. Follow Amili into the Planisphere. Collect the stars and return them to the Astronomer. Restore the three primary stars. Watch the stolen memory from the past and help Amili decide what to do next. Talk to the Astronomer to complete the quest and receive your reward. Amili can be heard calling out for help outside the Planisphere, talk to her to see what is wrong. "Aha! I knew that if I called out long enough someone would find me. Quickly now, come inside. Cultists have knocked the stars from our sky, and we have to put them back before all of Lord Seht's memories are taken for good!" "Oh, drat. Look, it's easier to explain once we're inside the Mnemonic Planisphere. That's where Lord Seht stores his memories-well, it's just easier to show you first." And cultists are stealing these memories? "Yes, exactly. You're a quick learner. I need someone who can fight off these cultists and help me return the stars to the Planisphere's sky. Please, you have to help us. This task is of the most vital importance!" "Stewardship of my memories carries a high price, Orvas. One that you must pay willingly." Amili Lloryn: "I've decided. I'll become the next Astronomer. I give myself willingly, to serve the Chrononymic Will as it has seen fit." The Astronomer: "So be it. I'll start the process now. Take care of the Planisphere... and yourself as well, Amili." Amili Lloryn: "You remembered my... augh!" The Astronomer: "I can finally rest." The Astronomer: "What was I... oh, a visitor." "The Mnemonic Planisphere welcomes you, traveler. Due to the recent attack, we are not holding memory viewings. You'll have to return at another time. How strange, I feel a sense of gratitude towards you, though I'm not sure why." I helped put missing stars back into the Planisphere's sky. "Ah, so you have? You have the gratitude of the Clockwork Apostles." "Now, if you'll excuse me, I must inspect the memories to see if they were damaged by the attack. You would be surprised how fragile they can be." Amili Lloryn: "I'm sorry, Astronomer. I just can't do it. I just can't give up who I am." Amili Lloryn: "I can better serve Lord Seht as myself. And I'll find someone to take my place, I swear it. Someone willing." The Astronomer: "So be it. You have made your choice, apostle. And now you will bear the consequence." The Astronomer: "You will be shunned from our order. Cast out, until the time which you can undo the wrong you have begot upon your people. Until you have brought me my successor." Amili Lloryn: "I... I'll do it. I'll accept this fate." 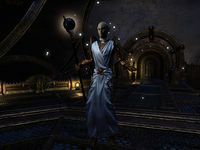 The Astronomer: "May Sotha Sil watch over your path, for I can no longer guide you." "I have maintained this position for over a millennium. It is my sole purpose, the path given to me by the Divine Metronome. I have no regrets." "I thank you for your efforts. A reward is common for these situations, yes? Here you are." I should follow Amili into the Mnemonic Planisphere to learn more about the situation. I need to collect errant stars in order to return them to the Planisphere's sky. I should search the halls surrounding the Planisphere to find them. I've collected the errant stars needed. I should return them to the Astronomer so he can place them back into the Planisphere's sky. Something went wrong with returning the stars. I should speak to Amili to find out more. The primary stars have been corrupted. I need to head to the three viewing platforms and use the calibration guides to show each star its place in the Planisphere's sky. I've returned all of the corrupted stars to their proper places in the Planisphere's sky. I should speak to Amili to find out what to do next. I should watch the stolen memory. 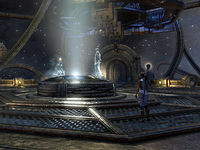 The stolen memory has revealed that Orvas willingly gave his memories to Sotha Sil to become the Astronomer. I should speak to Amili about what just happened. (If Amili leaves the Mnemonic Planisphere) Amili has decided to leave the Planisphere and retain her memories. I should stay with her as she tells the Astronomer. (If you convince Amili to become the new Astronomer) Amili has decided to give up her memories and become the new Astronomer. I should stay with her as the process is performed. Finishes quest (If Amili leaves the Mnemonic Planisphere) Amili has refused to give up her memories and has left the Planisphere. I should speak to the Astronomer. (If you convince Amili to become the new Astronomer) Amili has made her choice to become the Astronomer, sacrificing her memories to do so. I should speak to her. This page was last modified on 29 January 2019, at 23:55.